'Missing you!' 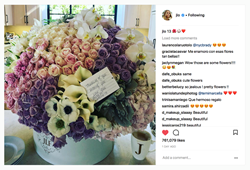 Jennifer Lopez shares a photo of the fabulous J'Adore Les Fleurs arrangement sent by Alex Rodriguez. There are a lot of cute couples in Hollywood, but Jennifer Lopez and Alex Rodriguez are definitely one of the best. Although their hectic schedules don't allow them to be with each other all the time, they still show their love for each other from afar, and He still finds the best way to show her how much he misses her. J’Adore Les Fleurs (JLF) is a high end flower retailer specializing in custom creations placed in their signature boxes. 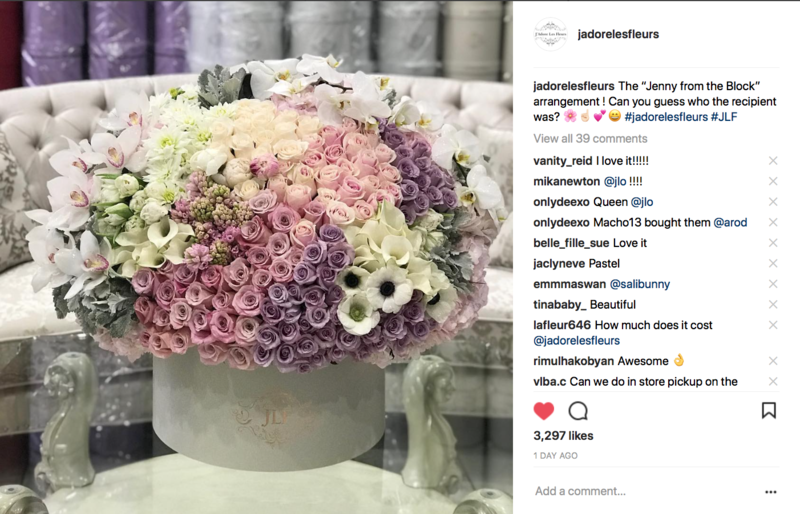 JLF is one of the most prominent flower retailers on social media with over 147K followers on instagram. The family-run business was started in 2015 by co- founders including lawyer Eliza Glants, 33 and fashion designer Alisa Tovmanyan, 27. JLF has three locations: Glendale, Pacific Palisades, and Studio City, as well as headquarters in Glendale, CA. JLF delivers within the Southern California area (with complimentary delivery to Pacific Palisades, Glendale and Studio City) and ships the JLF EverlastingTM Rose Collection nationwide. Purchases can be made online, in-store, and over the phone. Starting at $120 plus shipping or delivery fee. Inspired by the concept of Hat Boxes in the Victorian Era, the elegance of French fashion and style and the chicness of Laduree Patisserie packaging, JLF became the first specialty flower boutique in the United States to create fresh flower arrangements in our signature boxes resembling Hat Boxes. Within two years, the company expanded into 3 brick-and-mortar stores offering fresh flowers and hand delivery within the greater Los Angeles area and gained social media popularity. Among the celebrities who snapped their JLF Boxes are Khloe Kardashian, Kris Jenner, Anastasia Soare, Jennifer Lopez, Kate Botsworth, etc. J’Adore Les Fleurs not only approaches flowers as just flowers, but are a family that allows feelings and intuition to play their part when creating lush arrangements that will truly make an everlasting impression for your loved ones. For more information visit https://www.jadorelesfleurs.com.